It's hard not to consider albums by the Pistol Annies as minor miracles. And if that sounds condescending or disparaging to the talents of the three women in this group, it absolutely isn't intended that way - more to highlight that supergroup projects of any stripe rarely work or balance themselves out well, much less rise to the sum of their parts and at points even exceed them. Keep in mind the alchemy of a project like this: Miranda Lambert might have been a critically beloved hitmaker coming out of the 2000s, but Ashley Monroe was far from proven on her own as label nonsense had stymied an otherwise fantastic debut project. And Angaleena Presley hadn't yet kicked off her own solo career that would win critical acclaim from indie country fans, but from few others. And yet the Pistol Annies found a way to make it click with two terrific albums in the early 2010s, mostly because of the sort of understood balance and chemistry that led to a unification of theme but a distinct voices. And what I've always found amusing is the subversion of expectations: from opening singles like 'Hell On Heels', you might expect the trio to use their collaboration as a wish-fulfillment distillation of their most recognizable archetype, but they were smart enough to lend impressive amounts of nuance and detail to their storytelling to not only accentuate everyone's unique voice, but also a thematic core with real weight to not just show who they were, but what got them there. And then after knocking it out of the park in 2011, they'd do it again in 2013 with Annie Up, which added a bit more meat to their stories even if the quality wasn't quite as consistent, even as the insurgent bro country scene would bulldoze over everything in the rest of that year. Fast forward to now, five years later... and it's hard to ignore how much has changed. All three women have put out multiple solo albums to the point where it's hard not to assume that a reunion was never in the cards. And there's been upheaval too: while Ashley Monroe's material has been more reserved and light with the wry hidden edge, Miranda Lambert has chronicled her infidelity and the collapse of her marriage in the sort of weighty double album that casts a long shadow, while Angaleena Presley made the sort of blistering and pitch-black solo indie country albums which won a ton of acclaim and where a Yelawolf collaboration actually made sense! If anything, each artist has drilled into their solo voices and sounds so deeply that it makes you wonder that if bringing things back together will dampen this power or strike the same balance. But you can bet I was curious to see if this reunion could make lightning strike a third time, so what did we get with Interstate Gospel? Well, it's tough to say, mostly because if there is a project where the gap between caricatured image of the Pistol Annies and the heartfelt, heartbreaking songwriting appears, it's on this album. And with that in mind, it's hard to tell how this'll be received or appreciated, because if you're just coming for more of 'Hell On Heels', you're not going to get that - in fact, I'd argue this is probably the most mature, most downbeat, most bleak Pistol Annies album to date, the sort of slow-burn that's content to simmer and avoid the majority of easy jokes. Not all of them - which is why this album isn't quite among the best of the year and sadly is getting promoted off those jokes more than anything - but it's a damn great listen all the same and the sort of project that picks up more layers of emotional nuance with every single listen, which is a major plus. At the same time, though, I can see this being a tough sell to a lot of people who only know 'Hell On Heels' or are just coming for the supergroup novelty, because, to put it bluntly, none of these women are looking to fit in that lane, instead honing in on a lot of the subtext that has been hidden behind the previous two albums. If previous Pistol Annies records only implied the sort of dynamics that would make a person want to embody a hellraiser, Interstate Gospel decides to dump the weight of reality and age upon the situation - it's a heavier listen by design, where the burns have scarred over but the situations feel all the more entrenched... except when they can't be, and then it's played with the weight it deserves. More than ever it recalls The Weight Of These Wings by Miranda Lambert in both the embrace of more atmospheric layers but also women who by society's standards live hard lives. Sure, a song like 'Stop Drop and Roll One' might play as another hangover anthem, but when you follow it with the more middle aged 'Best Years Of My Life' where the weight and consequences of settling down hits a lot more heavily... hell, Future might talk about grabbing the percs, but when Ashley Monroe describes it as recreational to get through the worst of the listlessness she feels, it actually has impact, as does 'Leavers Lullaby' where she realizes she can't change so she has to cut and run. And while it'd be an easy thing to plug the shadow of Blake Shelton into Miranda's storytelling - 'Masterpiece' is probably the place where it fits most cleanly - what I love about these songs are how their focus is on women's stories. 'Cheyenne' is the obvious standout, with the mixed feelings of wistful envy and sadness at seeing a girl who finds a little more comfort in that life, but the one that really struck me was 'Milkman', where they talk about a strained relationship with a more conservative mother, and what I love is that the framing doesn't really paint anyone as more right or wrong - yeah, maybe that mother would 'get' them better if she had taken more risks and lived a little harder, and maybe if she was younger she wished she could, but she found happiness in her lane and you can tell they're still grappling with that on some level, when you find yourself feeling more progressive than your parents especially if it could have given them a more fulfilling life. But I'll say this, when Angaleena Presley takes the lead, we get two of the most subtly devastating cuts she's ever made, from the hard-bitten work on '5 Acres Of Turnips' where the unforgiving family farm work becomes a pretty striking metaphor for the relationship, but what really hit harder was 'Commissary', where she refuses to put money on a guy's commissary card while he's in prison, and between her being the only one to not lie for him, how often he's getting beaten behind bars, and yet how those bars are the only thing keeping him alive long term... yeah, you might not a full grasp of the relationship, but the implications here are dark as all hell! Unfortunately, this is where we encounter the frustrating contradiction with the Pistol Annies, because for as dark and heavy and mature as this album gets... it doesn't live in that space consistently, which is a problem because that's where the best writing is. Indeed, it's hard not to feel like the more upbeat or simple songs were made at the behest of the label for something that was more accessible. So on the plus side we do get a few good cuts like the title track and 'Stop Drop And Roll One' and I'd probably even include the closing song 'This Too Shall Pass', which feels very much about the trio themselves balancing their egos and love for each other... but then we get songs like 'Got My Name Changed Back' which feels really gimmicky and at this point overdone for the Pistol Annies. But the worst song here by a mile is 'Sugar Daddy' - and look, I get the ironic juxtaposition by immediately following this song with 'Leaver's Lullaby' and I guess there's nothing that wrong with a smoldering glorification of the guys now in their lives, but it felt weird as hell when we had 'Loved By A Working Man' on Annie Up and if anything it's worse here, because there's no punchline or twist, it just feels like a bone thrown to the guys and radio executives who aren't going to play this anyway! And while I'm on the subject of nitpicking, I've tried to avoid comparison between the vocals of the group, especially as they all bring a distinctive synergistic energy... but I'm not sure if it's the choice to opt for slightly heavier atmospherics or her delivery feeling a bit too reserved, or even just her mic placement within the mix, but Angaleena Presley can occasionally sound a bit too quiet and while there are no true hell-raising songs on this album, her richer timbre is really the foundation of this album and should be given the placement to highlight it. Granted, this brings us to a conversation about the production and instrumentation, which for the most part I actually really like. Frank Liddell has worked consistently as a producer with the Pistol Annies and Miranda Lambert specifically for over a decade and what impresses me is how much he can update the sound to be contemporary with indie trends while not compromising the texture and tone, and while I wouldn't quite say he gets the same burnished pickups as Dave Cobb, he actually knows how to mic a bassline consistently and it lends a lot of these songs an impressive amount of groove if not a lot of momentum. This is where we run into that Pistol Annies contradiction again in that when it comes to the instrumentation we're not exactly get barnburners - oh there's sizzle behind 'Got My Name Changed Back' against the prominent banjos, but the slower tempos and more atmospheric arrangements do mean this album will start to run long, especially as the Pistol Annies give their backing band more space to spread out. Granted, that can create some odd moments like the blasts of horns on 'Leaver's Lullaby' that sound pulled straight from a Mavericks album, or the odd tempo change-up on '5 Acres Of Turnips', but it also means the pedal steel and fiddles are given more room for a slow-burning swell, from the keening touches around 'Best Years Of My Life', the more intricate acoustic line and great fiddle pickup on 'Cheyenne', the minimalist touches around 'Milkman', or the stunning atmosphere surrounding 'Commissary', and the vocal arrangements hit a smart balance between cultivating intimacy and some really beautiful harmonies. It feels a little more rounded and balanced than either of the recent projects by Miranda Lambert or Angaleena Presley, but not quite as soft as Vince Gill and Dave Cobb have given Ashley Monroe, and I'd argue it strikes a really strong balance... but again, this is an album you have let set in, I'd struggle to say it's got the same sense of immediacy or firepower even in its simmer that I liked about the previous two Pistol Annies albums. And that's one reason why I've struggled so much to put together this review, because I want to call this a great album, but there are problems I can't ignore. Yes, it has some of the trio's most layered and thoughtful compositions, but with 'Sugar Daddy' it also has one of their worst, and its placement on the album is jarring as all hell. It's an album that wants to be more contemplative, but at points can feel a little listless, and I think there are points the production got away from them on a structural level. 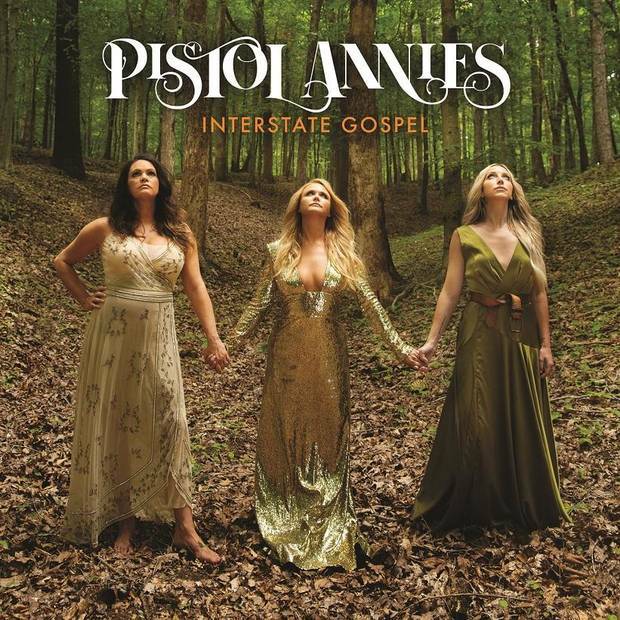 And the elephant in the room is that the previous two Pistol Annies albums are genuinely fantastic and Interstate Gospel just doesn't have the immediate gratification of their first two, which makes this harder to evaluate. That said, when the underlying songs and writing are as good as they are, I think it tilts this album just enough towards greatness, which means I'm giving this a 8/10 and absolutely a recommendation, but if you're coming from Hell On Heels or Annie Up, this is a different experience. Maybe just as if not more rewarding, but different all the same - check it out.